One of the more interesting concepts at CES this year was from AT&T who showed off the high-end Motorola Atrix with an associated laptop dock. The dock is shaped exactly like a thin-and-light laptop complete with an 11.6-inch screen and keyboard, but contains no CPU to speak of. What is essentially a laptop shell can only be used when the Atrix smartphone is attached to it. Multimedia functions of the phone, such as email and web surfing, can then be controlled with the more familiar netbook-size interface. Unfortunately, AT&T was reluctant to state a price on the intriguing laptop dock until very recently. The dock will cost a hefty $499 by itself, which may be much more than previously expected as even dedicated netbooks or tablets can be found at that price or possibly lower. 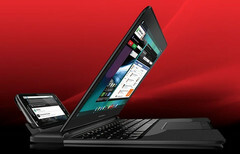 The Atrix and laptop dock can be had together for $499, however, if bought with an AT&T 2-year contract. The steep price may likely be a hard sell for many, but for those still interested, the smartphone and laptop dock will be available on March 6th with pre-orders beginning later this month on the 13th.